How does a Ping-Pong type of game mixed with bubbles sound? Intriguing right?! 🙂 Well introducing Gazillion Bubble Pong. Experience the first game of its kind that blasts your opponent with bubbles! Gazillion Bubble Pong delivers fun and excitement as you bounce ping pong balls into your opponent’s side to score points and blast them with a GAZILLION bubbles. The first person to score 3 times wins! And with 3 levels of difficulty, Bubble Pong is fun for the whole family. When the Bubble Pong game is over, turn on bubble machine mode for a non-stop bubble party! Kids ages 3 and older can play the Gazillion Bubble Pong game if a parent sets it up. You can also put the Gazillion Bubble Pong unit on bubbles only, without the game so you can enjoy a frenzy of bubbles. The unit comes with everything that you need to start having fun except the batteries. You need to install the 8 AA batteries to get the unit working. As with all battery operated bubble toys, you have to ensure that the battery compartment is kept closed and dry. If the battery compartment gets full of bubbles because of not properly closing the battery area, the unit could suffer damage. My biggest recommendation is to ensure you store the unit without the bubble solution in it and dry. This in my experience, helps to prolong the life of units of this nature. The goal of the Gazillion Bubble Pong game is to get your ping pong ball in the opponent’s side three times to win. Of course, it is actually so much fun to get the bubble frenzy going that I am sure the game will not stop at three. I am a huge fan of Gazillion Bubbles and their entire lineup of products that we have put to the test. Let’s face it…bubbles are a ton of fun and including a pong game with bubbles is magical. Gazillion Bubble Pong is game that kids of all ages will love…yep, including adults. If you love bubbles, you will love this game. 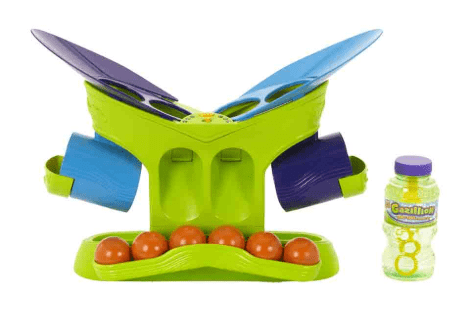 Gazillion Bubble Pong is a great backyard product and a wonderful playdate product. It could even be used at a party. I am actually interested to use it this winter because I want to see the bubbles freeze. We will have to keep the unit dry, out of snow, and not too cold out for the batteries, but I want to see it in action in the winter. If we get some good bubble action in the winter with our Gazillion Bubble Pong, we will share the wintery frenzy with you. Gazillion Bubble Pong makes a great gift year round for all the bubble fans in your house.